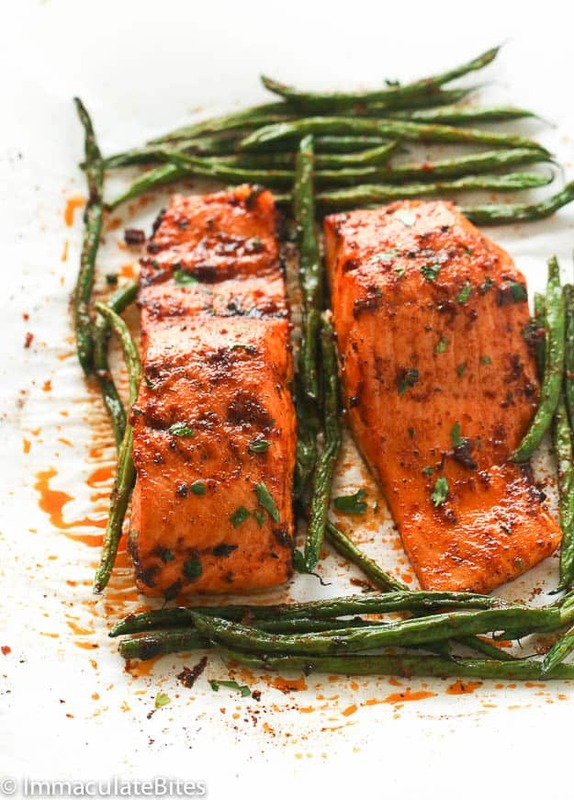 One Sheet Paprika Salmon and Green Beans. Easy no fuss weeknight meal cooked in a single pan in less than no time. Am pretty sure we all make one -pan sheet meals but really haven’t quite wrapped our heads around it or given it a name. I do it a lot: especially when am lazy or pressed for time, with leftover vegetables, fish, chicken, beef and carbohydrates. Sometimes, for me, it’s just a desperate attempt to get food on the table on time. When you have family always waiting on you. Yes! Some of the joys of being a mom right? This is an easy, yet tasty weeknight meal that you can make any time of the week. And it’s very customizable too! You can switch out the vegetables based on your preference or what is in season- carrots, zucchini, and bell peppers. You get to make that choice. My son wanted some green beans so I got a big bag of it at Costco and while I was there I got some salmon too. 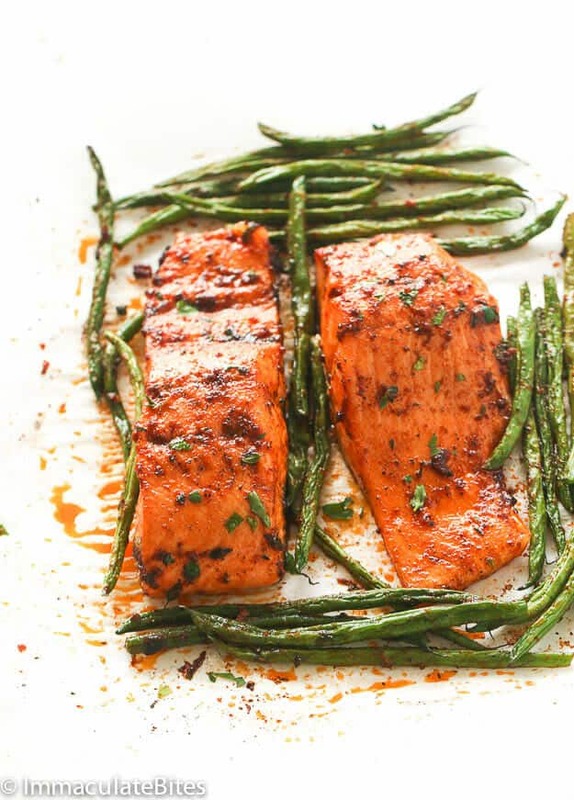 This is garlic paprika salmon is a spin off from this Paprika Garlic Chicken here, which if you have not tried you are missing out! 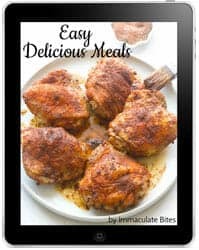 It is really an easy meal one to put on your to make list. 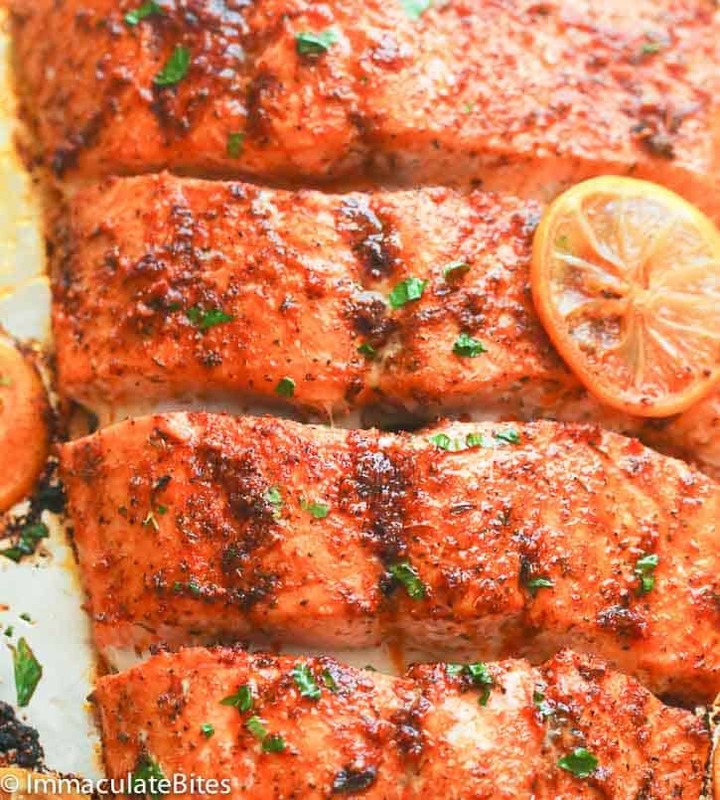 Or you can try this moist and flaky highly seasoned Oven Baked Salmon here with a lemony and spicy kick. Now, back to this salmon, the first time I made this for the blog it disappeared before I could take any pictures. This happens frequently in my household, luckily I had two pieces left and it’s comes together in less than no time. 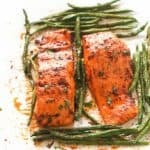 All you need is a few minutes to sauté the garlic, paprika and herbs.Then you brush on the salmon and vegetables, place on a lined baking sheet. Roast for about 15-18 minutes and you are all set. Clean up is a breeze here-not much cleaning involve. Enjoy!! 1 pound or more green beans and carrots or any vegetables. Position a rack in the center of the oven and preheat the oven to 400ºF. Line a baking sheet with foil or baking paper like I did spray or with cooking spray or lightly oil. Set aside. In a small pan set over medium low heat, combine canola oil, minced garlic, fresh herbs, smoked Paprika, onion powder and cayenne pepper. Stir for about 30 seconds or 1 minute. Let this mixture sit for a little bit about 5 minutes. Repeat the same process with vegetables place next to the salmon depending on your baking sheet. 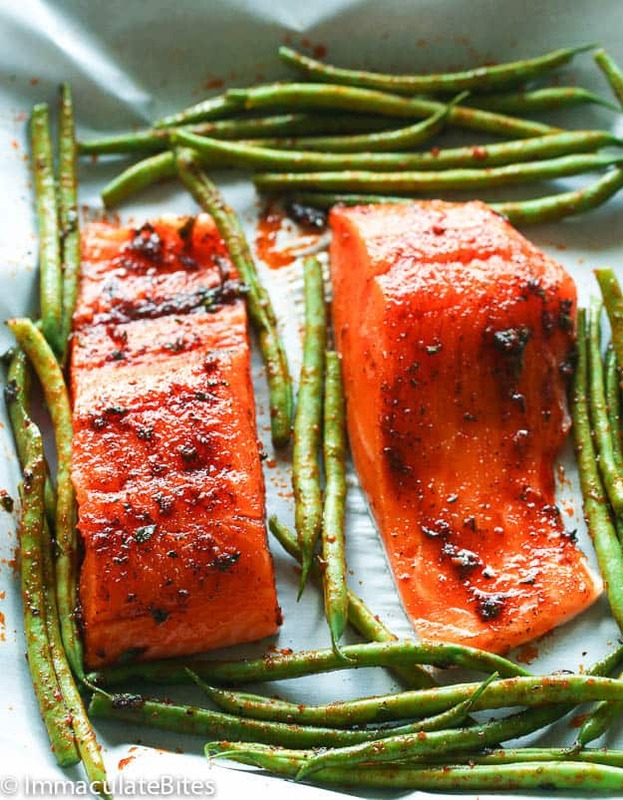 Allow the salmon to bake for 15-18 minutes or until cooked through. 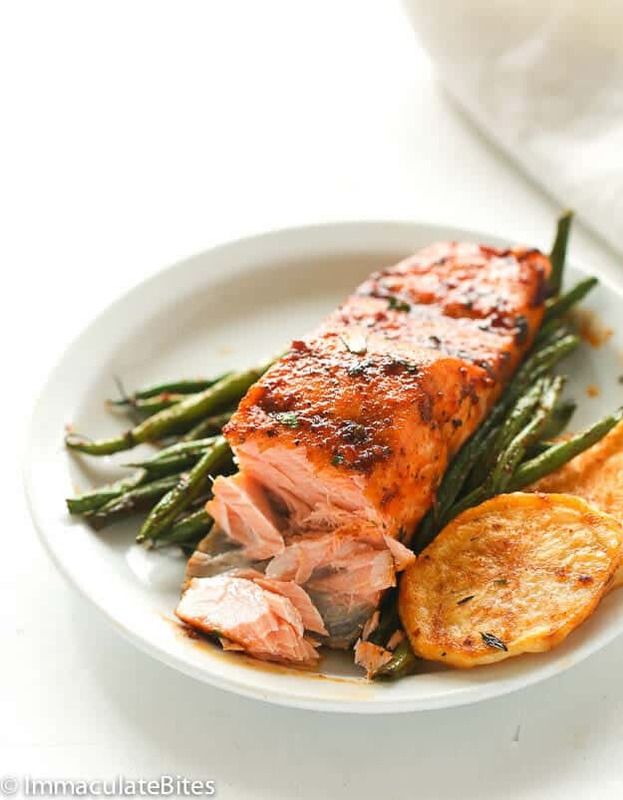 Cooking times will vary depending on the thickness of your salmon and preference. Hi Imma! The ingredients list call for bouillon but I don’t see it in the directions. Is it step 3 instead of salt? Yes, it’s either 1/2 teaspoon bouillon powder or salt . I just made this! Got the recipe from Greatist! Thanks for sharing! Awesome ! Do let me know how it works out for you. Oh my, I need this in my life!! This looks so delicious! I love easy and simple meals like this. I needed some more variation than just teriyaki. This sounds great. Thank you for sharing. This is lovely,infact i feal like eating from online. Gosh darn it!!!! Just made salmon yesterday and now wishing I had seen this. Guess there’s nothing wrong with eating salmon twice in one week. Thanks for this recipe an all the others. I live on this site…the best I’ve seen! Aww thanks Etondi! Really do appreciate you for coming back again and again. Happy Cooking!!!! Mmmmmm I have absolutely been craving salmon recently. Perhaps I’m not getting enough omega 3. This looks delicious. Thanks for sharing! You and I both. This has been my meal all week, you’ve got to give the body what it wants Emma. Great! I’ve got salmon at home right now. 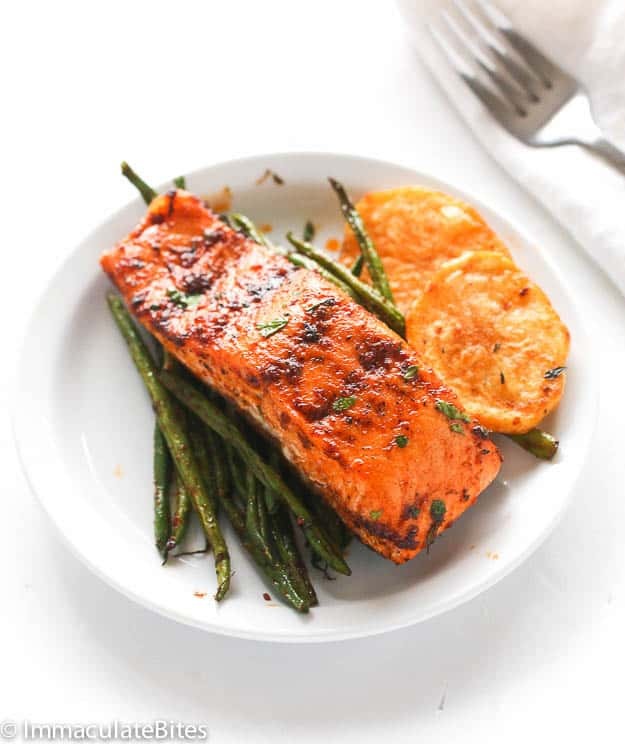 My eyes have been catching a lot of salmon recipes on the internet lately, but this one really appeals to me because of the simplicity. I’ve got this on my list of things to make! I was just debating how to best make the salmon in my fridge for dinner tonight. I was about to talk myself into sauteeing it, then I saw this. I suddenly have visions of a foil lined pan, an oven that will warm me up, and very little clean up. Perfect for a Tuesday night! Getting to dinner on the table in just about half an hour is a total win. I will need to try this! You will love it kit! Mmmm salmon AND a one pan meal. Win! Always a Win to me. I can see why you had a hard time taking pictures! This meal looks delicious. I love salmon and how it cooks up so quickly. Great recipe!